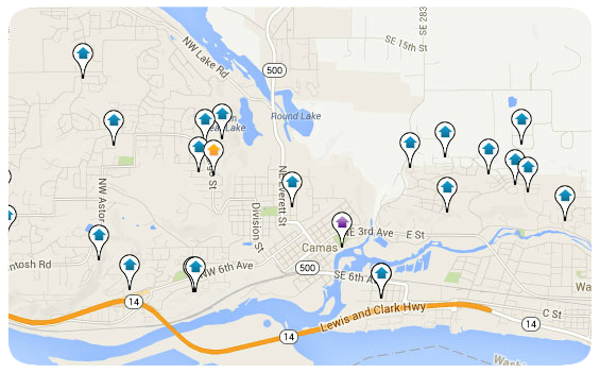 Anyone thinking of living in Clark County, WA will need to visit the City of Camas. This little community was named after the floral bulbs (Kamass) which were a staple of the local Native Americans. The city is located 20 miles east of Portland, Oregon. This city of approximately 20,000 residents lies along the Oregon border and rests along Prune Hill. The city’s 15.25 square mile area has all the conveniences of a big city while remaining close-knit and rural in nature. The city has a number of educational facilities such as two high schools, two middle schools and six elementary schools. Local community amenities include the Municipal Pool, Community Center, and Scout Hall. There are 14 community parks, as well as 600 acres and 22 miles stretch of hiking trails nearby. Although the city is small and sparsely populated, it is close to the principal roads and highways accessing Oregon and Washington State. Townhouses and single family homes are available on the open real estate market. Current inventory can be viewed through the MLS. The local real estate market has been witnessing the same increase in activity as the rest of the Western states of late. This market is influenced by commuters from the surrounding metro areas who are looking for attractive residential property. Camas residents enjoy access to the all of amenities available in the Portland area to the south and Vancouver to the west. Regardless of the accelerated development in and around the metropolitan areas, Camas continually maintains its history by keeping its cultural heritage alive.